Here's the second post in my series of posts on authors on fan-fiction vs. retelling. 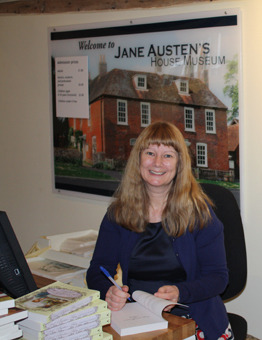 The second author is the Jane Austen master re-teller: Amanda Grange! What do you consider fan-fiction? I think everyone has their own definiton of fan fiction. I've never thought about it in any great depth but I suppose to me fan fiction is something based on other people's creations, written solely for the pleasure of the fan fiction author or possibly the pleasure of the fan fiction author's family and friends as well ,and then posted online. It doesn't have to meet any standards so it can be good, bad or anywhere in between. Do you consider your book to be fan-fiction? If not, what sets it apart from your definition? I think my books are different for a number of reasons. Although I get a lot of pleasure writing them and they are based on someone else's creations, I was a published author before I started my retellings (I'd had about ten Regency romances published), so I'd already spent years honing my skills, whereas a lot of fan fiction is often the author's first experience of writing. There's nothing wrong with this, in fact it gives a lot of people a taste for writing and they go on to become professional authors, but it means that for the most part the fan fiction authors don't have a control of their writing skills and so the results can be uneven. My books can't afford to be uneven. They have to meet professional standards and they also have to meet publishers' requirements. I have to deal with a whole variety of things like accuracy, length, deadlines and consistency, as well as adding something new while being true to the original. I have to do a lot of research to make sure all my historical details are correct, the language is suitable for the Regency period etc. and my book has to pass muster with an experienced editor before it sees the light of day. If I'd written the diaries as my first attempts at writing a novel, they wouldn't have been anything like the published novels they are today. They would have had problems with pacing, style, characterisation, narrative flow and everything else, so I'm glad the idea didn't occur to me until I'd already been through the process of writing my own books. Based on your definition, should fan-fiction ever be published? I really can't say. Some fan fiction authors don't want to be published, some publish themselves and some are picked up by mainstream publishers. But it's an interesting topic. I think anything that gets people writing and reading is a good thing! This is such an interesting case... Because if this story hadn't been printed as a book, but instead had been posted to fanfiction.net, no one would question it. And yet her experience, and the support of her publisher, gives this credibility and elevates it. It becomes "meta fiction" instead of fanfiction. A subtle but important distinction.